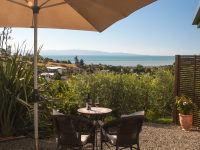 A warm welcome awaits in this stunning location with mountain and sea views 5 minutes from Nelson City. Lynn and Ash originally from the UK have traveled extensively and know what it is means to have a welcoming and comfortable place to stay. They will do their utmost to make your guests stay an enjoyable experience, provide your guests with local knowledge and are happy to book activities for them. The accommodation has its own private access and garden for guests to sit out and enjoy the view of the beautiful bay, relax and listen to the birds. Furnished in a French style the accommodation offers a kitchenette, a luxurious en-suite with bath and shower. The suite is air conditioned and features a TV, a dinning area and two comfortable armchairs. Guests will find free toiletries and a hairdryer. Wifi and cell phone coverage is excellent at all times. Breakfast varies including fruit juice and local fruits in season, continental, croissants or bagels. Nelson has some of New Zealand's most inspired wines, pristine beaches captivating sunsets and sunniest climate. You will want to return again and again. Original generation time 1.2780 seconds.